Foodlets is based on the concept that the pleasure in food is not just in eating but also in looking at it. 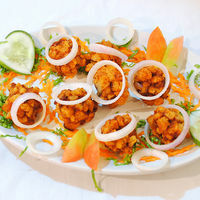 Just browsing through the food at Foodlets is bound to give you immense joy and boost your mood. And of course, there’s the occasional foodlet that intrigues you, makes you exclaim in wonder - “How did they do that?” or “I wonder how it tastes” or “They put that along with that! I can’t wait to try it out!”. This is the first part in a series where I’ll be trying to list out the most intriguing food at Foodlets. This is one of my favorites and it has an extraordinary taste! I always try to imagine how they must have made it! Spicy ice cream? Who would have thought of that? I wonder if they have one with chili flakes in it! Gratin is a widely used fench culinary technique in food preparation in which an ingredient is topped with a browned crust, often using breadcrumbs, grated cheese, egg and/or butter1. Sounds appetizing! Neer means water in Kannada. The batter used for preparing this dosa is very watery and thin, hence the name. Of course they put Apple Pie Syrup in the latte, but I like to think of it as crushed apple pie added to the latte! Anyways the taste is awesome! What is the blanket made of? How does it taste? What did they marinate the prawns in? Whats that accompanying sauce? Do they serve it in a Pyramid? Are some of the questions that come to the mind! Now this is a cocktail which our teetotaller friends can enjoy! Looks like ice-cream at first glance till you spot the egg slice on the top! I wonder whether its actually a cocktail of various types of prawns! Peri Peri is a piquant sauce made of red masala, red wine vinegar, parsley, fermented pepper paste and is a favourite in Goan cuisine2. I like the idea very very much! I like the 'get 2 for the price of one' kind of foodlets! In Goa, I was mostly used to having Mirchi Pakoda and of course Batata Wada, that is why I was pleasantly surprised when I came across Mirchi Batata Wada - the taste still lingers in my mouth! Yum! Yum! It’s a feast for the eyes as well and quite yummy! Tastes best with white chocolate. Chopped prawns rolled into balls and deep fried. Ingenious! Now why did the drunk Chicken cross the road? To get marinated in more whiskey, of course! The liquor does impart it a unique taste. Hic! Of course this list is entirely based on my tastes and what cuisines I have been acquainted with so far. However, the reader is welcome to give his suggestions and I can include it in the next part. "Hey thats a yummy read! :D Making me hungry as always.. hmm.. being a bangalore foodie..
m sure u ve tried out fava? the mediterranean restaurant.. Thanks Raji! I haven't been to Fava yet, but it looks interesting and I'll try it out soon. Meanwhile if you have any pics from Fava, do create some foodlets.